This IBM Redbooks® publication, Volume 6, introduces the Watson Text to Speech (converts written text into natural sounding audio in various languages and voices) and Watson Speech to Text (converts audio voice into written text) services. This book introduces concepts that you need to understand to use these Watson services and provides simple code examples to illustrate the use of the APIs. 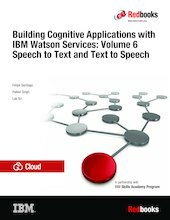 This book includes examples of applications that demonstrate how to use the Watson Text to Speech and Speech to Text services in practical use cases. You can develop and deploy the sample applications by following along in a step-by-step approach and using provided code snippets. Alternatively, you can download an existing Git project to more quickly deploy the application.